Prometheus is an open-source systems monitoring and alerting toolkit. It implements in-memory and persistent storage model for metrics as well as a query language for accessing the metrics. Prometheus is the third metrics integration supported by Aiven after the Aiven InfluxDB & Grafana integration and Datadog integration. The metrics delivery model of Prometheus is a somewhat atypical pull model where the Prometheus server connects to HTTP servers running on the nodes being monitored and pulls the metrics from them. While this makes the service discovery more of an issue than with the more common push approach, it does have the benefit of making the metrics available not just for Prometheus but for any app that can read the Prometheus format from the HTTP server running on Aiven nodes. To enable Prometheus integration for Aiven services you first need to create a new Prometheus configuration. This can be created from the Service Integrations page. You only need to specify a display name for the configuration and the system will automatically generate username and password for authentication. In most cases there's no need to define more than one Prometheus configuration per project and use the same one for all services. Creating the configuration doesn't in itself do anything yet and to actually enable Prometheus you need to go to the Service Overview page of each service you want to enable it for. 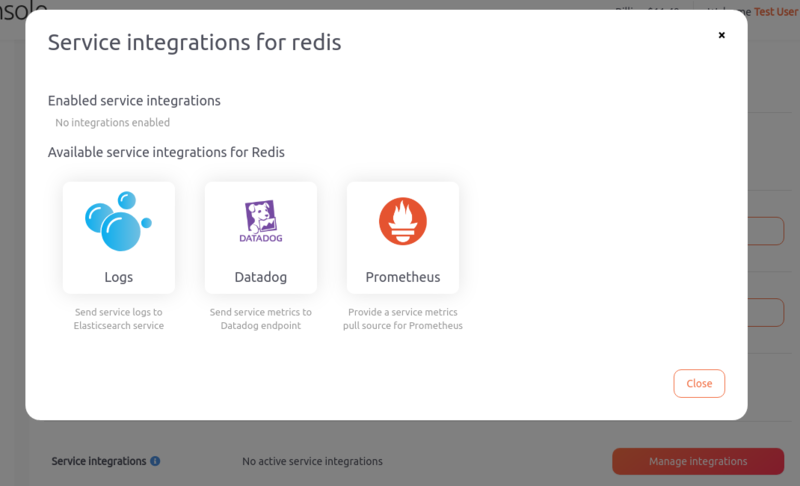 Click the Manage Integrations button next to Service Integrations and then select Prometheus from the popup. After finishing the wizard the system will start an HTTP server on all nodes of the service that provide access to the metrics. Note that there can be roughly one minute delay until the metrics are available. Aiven provides the Prometheus client via the Telegraf plugin so all the same metrics that are available via the Aiven InfluxDB metrics integration are also available via the Prometheus integration. You can easily see the full list of metrics by accessing the https://service-hostname:port/metrics resource for a service that has Prometheus integration enabled (or once Prometheus server is running from that server directly). Note that for some services the metrics provided by different hosts may vary depending on the host role. Most notably for Kafka only one of the nodes provides metrics related to consumer group offsets. To make Prometheus fetch metrics from Aiven servers you'll need to add a new scrape config with appropriate basic auth parameters (as seen on the Service Integrations page) and identify the servers to pull data from. For any services that consist of multiple nodes and each node doesn't have its own unique DNS name, you need to use the dns_sd_configs option for defining the servers with DNS type set to A. This causes Prometheus to resolve all the IP addressess associated with the DNS name and query all of those IP addresses directly. A side effect of using this IP resolution is that Prometheus expects the TLS certificate to be bound to the IP address of the hosts, not to the DNS name, so to make the connection work you must enable the insecure_skip_verify setting. For services where a DNS name resolves to only single node using static_configs instead of dns_sd_configs may be preferable as it allows doing all the regular certificate checks. Do note, however, that the certificate provided by the Aiven servers is signed by the so called Aiven project CA instead of a generally trusted CA and you must set the ca_file setting under tls_config to point to that file. For most services it can be downloaded from the service overview page in Aiven web console or alternatively the Aiven command line client can be used (avn project ca-get). The file is identical for all services in the same project.